Sources in Netanyahu's office criticize Bennett for opposing proposal to have 'settlers' live under PA, claim it was all a ruse. 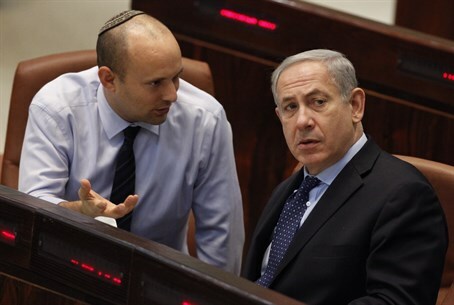 Sources in Prime Minister Binyamin Netanyahu's office have criticized Economics Minister Naftali Bennett's comments opposing Netanyahu's reported proposal to have Jewish residents of Judea and Samaria live under the Palestinian Authority (PA). The sources claim Bennett harmed Netanyahu's clever attempt to "expose" the PA's true face: its hatred of Jews, as evinced by its refusal to accept a Jewish presence in areas under its control. As early as last July, PA Chairman Mahmoud Abbas declared his intentions to not leave "a single Israeli - civilian or soldier - on our lands." Those sentiments were reiterated last December. As expected, PA chief negotiator Saeb Erekat confirmed the PA position, responding to the reports Sunday by declaring "no settler will be allowed to stay in the Palestinian state, not even a single one." Nevertheless, sources in the Prime Minister's office claimed Bennett's sharp response to the reports that Netanyahu believes a Palestinian state shouldn't be “mono-ethnic" harmed the "exposure" of the PA's real position. While Netanyahu's office appears to be complaining about Bennett's criticism, there has been an outpouring of criticism from Netanyahu's Likud party as well, lending credence to reports of Likud "rebelliousness" against Netanyahu's apparent readiness to make extreme concessions to the PA.
Deputy Minister of Transportation, MK Tzipi Hotovely, said that “a diplomatic plan that relegates the Jewish settlement enterprise to Palestinian sovereignty will not receive political backing in Likud." Deputy Foreign Minister Ze'ev Elkin slammed Netanyahu's proposal, saying "only someone who can live under the illusion of 'and the wolf shall live with the lamb' and that the lives of hundreds of thousands of Israeli citizens can be left to the mercy of the perpetrators of the lynch in Ramallah, can really believe that the security of the residents of greater Tel Aviv and central Israel can be safeguarded in case a Palestinian state is established."